These charms are made from high quality plated rhodium which is a metal from the platinum family. They won’t tarnish or rust, are extremely durable and are scratch resistant as well. 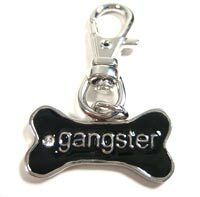 This BONE charm is black and silver and has the word spoiled written in the middle to describe your spoiled rotten pet. Each charm comes with one crystal embedded in it. These charms with their attached D-ring clasp, clip easily on all dog and cat collars or keychains. Approximately 1 inch x 1/2 inch (2.5 cm x 1.25 cm) not including the attached keyring.